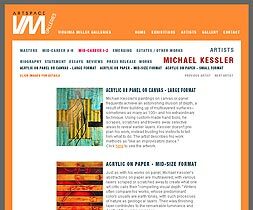 Michael Kessler, who has exhibited in top galleries since 1983, has won a number of major awards, including the highly prestigious Prix de Rome, given to only two U.S. artists each year. The award includes a cash stipend and a year’s residency at the American Academy in Rome. His visits to ancient Roman sites inspired a series of his works, whose multiple layers of paint–”sometimes upwards of forty coats”–give his works an incredible illusion of depth.